Min. Height: 200mm / 7.87"
Max. Height: 385mm / 15.15"
Adjustable Height: 60mm / 2.36"
Lifting Height: 125mm / 4.92"
1. Put jack in vertical state. 2. Lower the pump and piston, until it is completely loose. 3. Remove the rubber oil plug. 4. 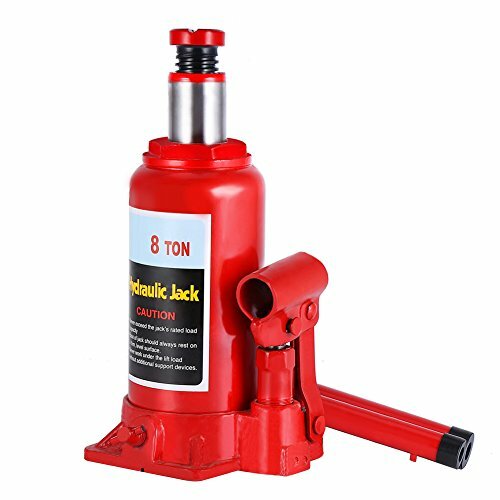 Pour into high quality hydraulic oil. 5. Mount rubber oil plug. Whole body casting with thickened steel plate construction is built for longevity and durability. 2 parts handle for easy storage, long handle make lifting easy and saves your labor. Simple Operation: Release oil return valve for auto descend; It's convenient and quick. Features the unique cross grooves forced release valve that ensures stability and safety and it is protected from overload. Ideal for use with automotive, construction, industrial and agricultural applications.